Apple watches come with either 8 GB or 16 GB of memory and storage for your apps, photos, and music. The Apple Watch adds a valuable layer of accessibility and communication to everyday technology. For example, with an Apple Watch, you can silently get meeting reminders or personal messages without disrupting your workday. Indeed, the long list of features is impressive, but you'll have some decisions to make before you make a purchase. The size, band design, and color are appearance selections you'll need to make, and your choices regarding wireless technology and processing speed will affect performance. 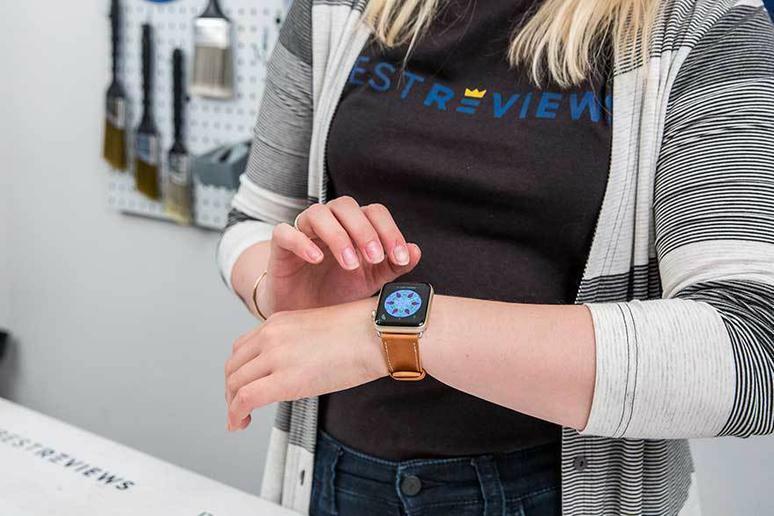 The Apple Watch can link with your iPhone, iPad, and any other Apple devices, providing many of the same features you already enjoy from the convenience of your wrist. When it comes to music, Apple Watches offer several benefits. Some models can stream music directly through the watch, and the audio is pretty good considering it's a watch. And with some watches, you can remotely control the music playing on your iPhone. With Apple Pay on your wrist, you can leave your wallet at home and pay for purchases securely while out and about. You just need to make sure the retailer or business you're patronizing supports Apple Pay. We already mentioned the remote control that an Apple Watch provides for your music. It can also provide remote control for Apple TVs and some smart devices. And just think: you'll never have to worry about losing your remote because it's strapped to your wrist! Apple Watch faces are measured from the top of the screen to the bottom. They come in several sizes, with the most common being 38mm and 42mm -- both of which have a10.5mm depth. The 38mm models are intended for those with small wrists. If you have large wrists, a 42mm model would likely fit better and also provide more viewing area. Apple's latest series, Series 4, adds 30% more screen with both 40mm and 44mm options. Size isn't just about comfort; it's also about display quality. Apple's 38mm watches have a 272 x 340-pixel resolution; Apple's 42mm watches have a 312 x 390-pixel resolution. The newer 40mm screens have a 294 x 324-pixel resolution, and 44mm screens offer 448 x 368-pixel resolution. Aluminum is the lightest option. It's a favorite amongst athletes and those who lead an active lifestyle. Ceramic is the heaviest option; it's also the most luxurious. Ceramic is harder than stainless steel, and Apple has worked to develop a formula that's not brittle, so these cases have excellent durability. You're not stuck with the band that came with the watch. Apple sells bands separately so you can choose from a long list of materials and colors. Apple Watches are designed to be used with an iPhone, so all of them come with WiFi and Bluetooth capabilities. Reliance on this technology requires you to have your iPhone nearby. However, Apple Watches with LTE cellular technology can connect directly to the internet using data from your data plan. You can make and take phone calls even when your phone isn't around. On the downside, LTE technology dwindles battery life fairly quickly. Apple Watch prices vary depending on features. Basic Apple Watches that run from $240 to $279 are WiFi- and Bluetooth-capable but not waterproof, nor do they have built-in GPS capabilities. Apple Watches that add a built-in GPS usually fall in the $320 to $360 range. Models with LTE connectivity and are waterproof with built-in GPS usually cost between $400 and $800. Add a leather band, and you're looking at a watch that costs over $1,000. Our take: It's lightweight and sporty, and it has some great features that add convenience in case you don't want to carry your phone. What we dislike: It's not waterproof and lacks a built-in GPS.